2019The Classic of Tea is the first known monograph on tea in the world, which took Tang Dynasty-era (618-907) writer Lu Yu five years to compile and another five years to revise. The Classic of Tea is the first known monograph on tea in the world, which took Tang Dynasty-era (618-907) writer Lu Yu five years to compile and another five years to revise. This book is a "bible" for every tea lover. With Wang Jianrong's detailed interpretations and illustrations of ancient tea paintings and wares, the book offers a brand new way for tea lovers to embrace the world of tea art and get a taste of its beauty. This book was compiled using the inscriptions of a Song Dynasty edition archived at the National Library and has been proofread from many other ancient versions, aiming to offer readers authentic tea art flavors. 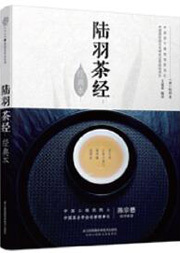 Chen Zongmao, an academician at the Chinese Academy of Engineering and honorary president of the China Tea Science Society, wrote the preface for the book. It is a guidebook for both newbies taking their first steps into the world of tea art and specialists looking to sharpen their skills. ·Wang has been promoting tea culture for over 10 years and compiling some 40 books on the subject. His books have won appreciation from both experienced insiders and ordinary readers.